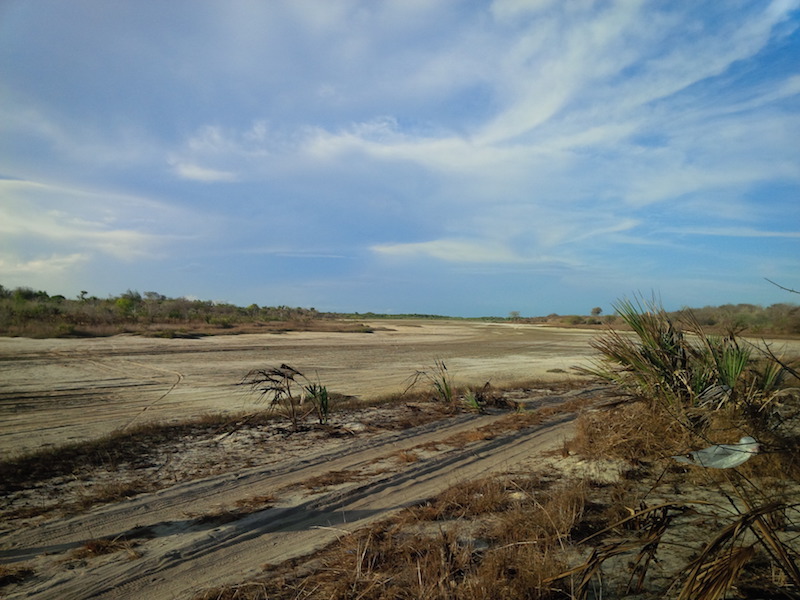 After the morning session with the county officials, we had a chance to visit the planned site of the Amu Power coal plant at Kwasasi, on the mainland. This was my third visit to Lamu in four years, but my first chance to visit the mainland of Lamu County. The Lamu islands are incredibly beautiful, and once you experience Lamu, you are unlikely to look at Mombasa the same way again. It’s a beautiful place for tourists to visit; boat rides, the endless beaches of Shela, the quaint town with tiny streets, curio shops, friendly residents, ancient buildings, tasty foods served on roof top restaurants, and a world heritage status conferred on the town. Also for tourists who come to Lamu, unlike travel to Mombasa where they have to contend with at least an hour of traffic around both Jomo Kenyatta and Moi airports, they can fly to Lamu having skipped the traffic bit by using Wilson airport in Nairobi, while in Lamu, there’s no such thing at traffic – as you land on Manda island, walk 300 meters and get on a boat that can get you to a hotel or villa within ten minutes. But while it’s beautiful for tourists, life is not getting better for residents. The boat rides are expensive, unemployment is high, and education is low, and the land has other challenges. To get to the Kwasasi site, we took a 15-minute boat ride to Mokowe jetty where several taxis were waiting. 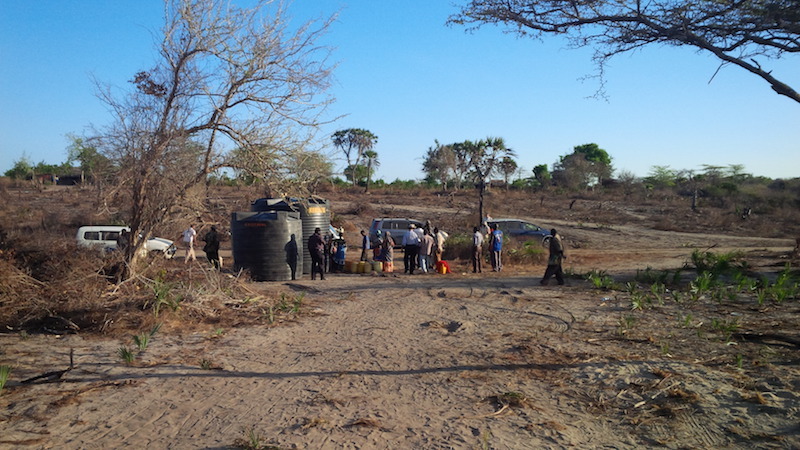 Mainland Lamu, which borders Somalia about 100 kilometers away, has been in the news over the last two years due to sporadic attacks and incidents, with the most catastrophic being Mpeketoni in June 2014, where 48 people were killed by a terror gang. The first stop after stepping off the ferry on the mainland was to drive to the local police station to collect some armed policemen that the company had hired for the day. After that it was a long drive over about an hour that covered about 30 kilometers on narrow dry dusty roads. Lamu County is said to have 6 kilometers of tarmac, but this main road on the mainland had none. Eventually, we got to a Navy base, which also marked the edge of the port area. This was our starting point and we drove along the fence of the navy base, which had a road then away from the fence with satellite tracking devices to pinpoint the coordinates of the corners of the site and this took about two hours to navigate. Amu Power had contracted a landscape architect to produce real life drawings of what the plant would look like in the current environment, and he took several pictures at each corner of the site and strategic points on the road. 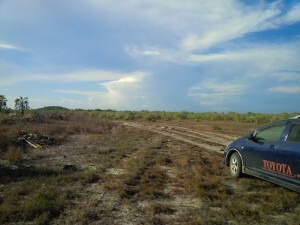 The site of the plant was a large plain field with sparse bush. This was a shock as I expected to find warehouse sheds, office and residential buildings to mark the edge of a LAPSSET (The Lamu Port Southern Sudan-Ethiopia Transport Corridor) port city. But the place was sparsely populated and devoid of structures or developments. This was apparently communal land, but there were sticks in the ground to mark boundaries in some places and burnt bushes in other places presumably for cultivation clearing. In some places targeted for LAPSSET projects, speculators in the area have pushed up the price of land five times in the last few years. Another shock was seeing many women and girls walking along the road with yellow 20-liter drum, full of water. This is an arid area, with few water points and the role of fetching water is one performed by women who walk long distances. We later stopped at one of Amu Power’s CSR projects, which were a series of water tanks at a central point to which a company lorry delivers water every week for area residents to use. It should not be the business of prospective investors to provide water, but that’s the reality of doing business in many parts of the world, and the water delivery has made life easier, with more to be done. Amu Power has plans for the construction of a water desalination plant, which will be the first ever, built in Kenya, and the excess of this will be shared with the local community. We left just before sunset and asked the taxi driver about the ongoing curfew that was in the area. He said it was still in force, but had been relaxed of late. After we got back to the Island we had a few more talks to recap the day. Earlier, one of the community leaders has talked of the challenges Lamu had faced and why it had remained largely unchanged 50 years after independence with issues like water shortages, transport challenges and lack of roads. He said, while Lamu was poor, there had been resistance to several past attempts to introduce development projects in the area– including a fertilizer plant, the new port (because it would spoil fishing), and wind power in Shela (because it would spoil the water). The day after the visit, as we prepared to leave and fly back to Nairobi, we started hearing reports of the ongoing attack at the university in Garissa. The full scale of the attack did not become apparent till later in the day. It is expected that President Uhuru Kenyatta will be in the area in a few weeks to commission the first three berths of the Lamu port that is set to be completed in 2019. The port, crude oil pipeline, the coal plant in Lamu and Lamu-Garissa-Isiolo Road will raise the profile of Lamu and thus the government’s investments to enhance the security profile of the area. The fringe benefits of this infrastructure will be to open up the Eastern and Northern part of Kenya to development and settlement, the way that the British railway did over 100 years ago between Mombasa and Kisumu. 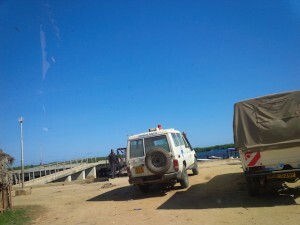 Clearly, not only is change coming to Lamu, change has to come to Lamu. 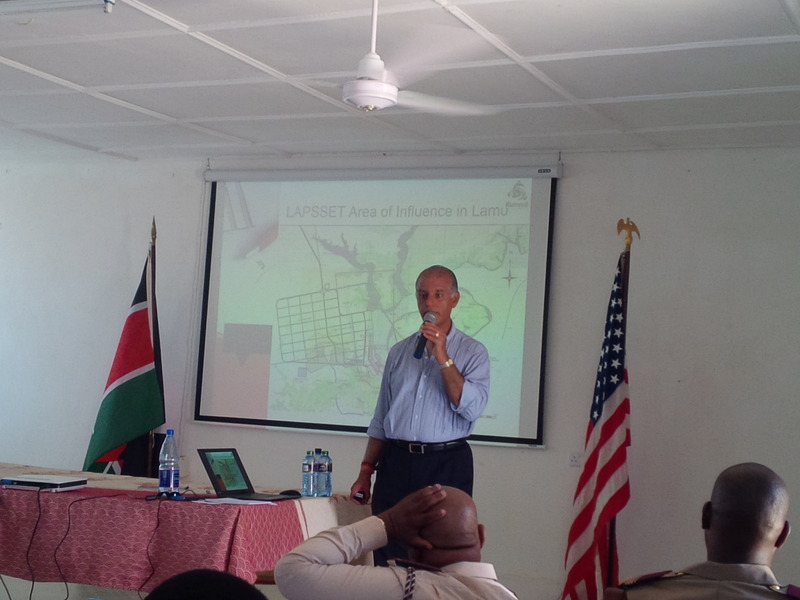 The LAPSSET projects and the coal plant are about 30 kilometers from Lamu town and the picturesque islands that most people in Lamu are familiar; that’s about the distance from Mombasa island to Diani beach and its possible that the two will coexist and mutually benefit like the South coast neighbours. This entry was posted in Amu, Centum, ICDCI, Kenya economic growth, Kenya privatization, Kenya real estate, KPLC, Lamu on April 30, 2015 by bankelele. Earlier this month, I took a trip to the Lamu county at an invitation from the Gulf Energy side of Amu Power, and Gulf are the leading a project that will see the construction of a coal power plant that will generate 980 MW for Kenya. This is part of an ambitious project by the government to invest in and diversify its future energy generation capacity, from one that’s relied for years on hydropower dams and more recently to diesel, geothermal and wind power sources. 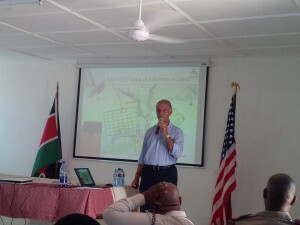 The coal plant to be built by Amu Power is one of several large projects planned by the government for Lamu, and the team from Amu Power has been meeting with various stakeholders over the last few months including sessions with residents of the area, coastal governors, other politicians, and elders. 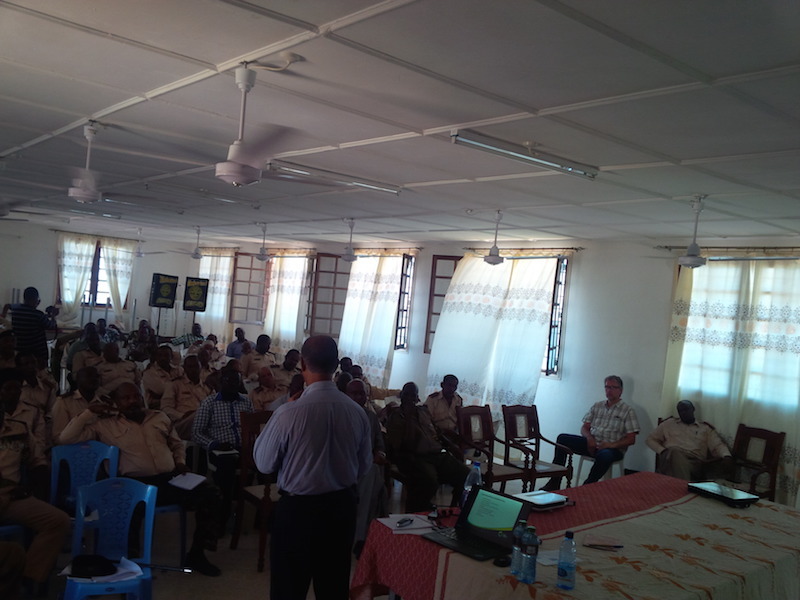 This one, at the American Centre in Lamu town, saw the Amu Power team meet with their community partners, and local county staff, led by the Lamu county commissioner, district officers and area chiefs, and DO’s. They form a vital link being the government administrators in the community, heading security and intelligence teams, and it was to explain what the company would be doing over the next 3 years. The 980 MW Coal Plant in Lamu is being built for Kenya’s Ministry of Energy and Petroleum on a build, own, operate and transfer basis for 20 to 25 years. But already, there has been some controversy by some NGO groups who have started a campaign in communities and on social media to stall or discredit the project. By having such sessions with the area leaders, Amu Power were hoping to avoid a repeat of issues such as in Kinangop where residents have delayed a wind power project. Sanjay Gandhi, a consultant working for Amu Power, explained that coal plants of years past are not built anymore and there is new technology that mitigates the old environmental challenges that come from coal. He noted that all projects have effects on the community, but with good mitigation measures these can be alleviated. The Amu Power plant will be built by Chinese contractors, but to standards set by American institutions. Also the Amu Power offices will be on site and they will live and supervise the plant with full teams of staff for the next 25 years. Sanjay explained that Kenya needs the electricity and that peak demand has gone up from 899 MW in 2005 to 1,470 MW in 2014, with Lamu town itself still powered by diesel generators. KPLC is adding 200,000 customers every year, and it is expected that peak demand for electricity will reach 5,359 MW by 2017. Coal is also the cheapest form of energy at 7.5 US cents (Kshs 6.30 per unit) compared to geothermal at 9 C, and solar and wind power 12 C /kwh (Kshs 8 per kilowatt-hour). He said coal is the most cost-effective way of generating industrial power, and once you turn it on, the plant will be able to run for 8 months without turning off. Kenya’s ability to add new hydro dams is diminishing and renewable energy sources like wind and solar power are not consistent enough for industries to run. The government’s only investment will be a through commitment to buy electricity 981.5 MW of electricity at Kshs 6.3 per unit and the Amu Power plant will be built to handle different types of, whether from Kitui county (where coal has been found), or imported from South Africa, Mozambique, or Indonesia. 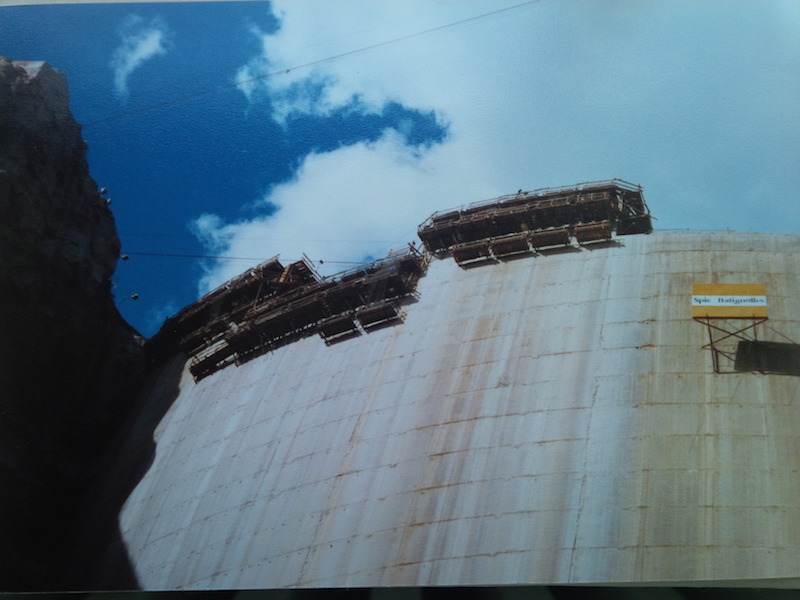 Amu Power is planning to complete the plant through 21 months of day and night work; this is after 7 months were lost in court following the government decision to award them the project. They will build on 870 acres of land that the company will lease from Kenya Ports Authority who are buying land from residents in the area, and while actual boundaries have not all been determined, people have been buying and speculating on land value appreciation in and around the site. They have identified a Chinese contractor to do the work, and the company wants 1,000 local youth to go to the National Youth Service (NYS) for 6 month training to be ready for work in October. They have started with Pate area and plan to find 100 people in each of the 10 Lamu wards to be trained and employed as masons, brick layers, welders, fitters, riggers, electricians – and if the contractor can’t find local people, they will get others from outside the area. They estimate that the plant will need 2,000 employees on a full-time basis during construction, and 3,000 at peak. Thereafter, there will also be 500 permanent jobs for 25 years, and while early managers will be Chinese, there will be a requirement for each foreigner to have a Kenyan understudy throughout. There are opportunities for the local community to prepare and provide all that is necessary for these workers, such as housing and food in addition to supplying building materials for the construction. After the talk, there was question and answer session in which local chiefs raised various points of concern including – plans for local fishermen who rely on fish catches for they livelihood, need to re-forest the area, need for completion of school classrooms, need for sea wall rebuilding in some places, a need to train youth in small business skills, the lack of bursaries for school kids, as well as the challenge of combating drugs and alcohol, which were mentioned in the Lamu county development plan. They also raised the issue of controversial payments for land ownership that has happened in some areas of the planned Lamu port. 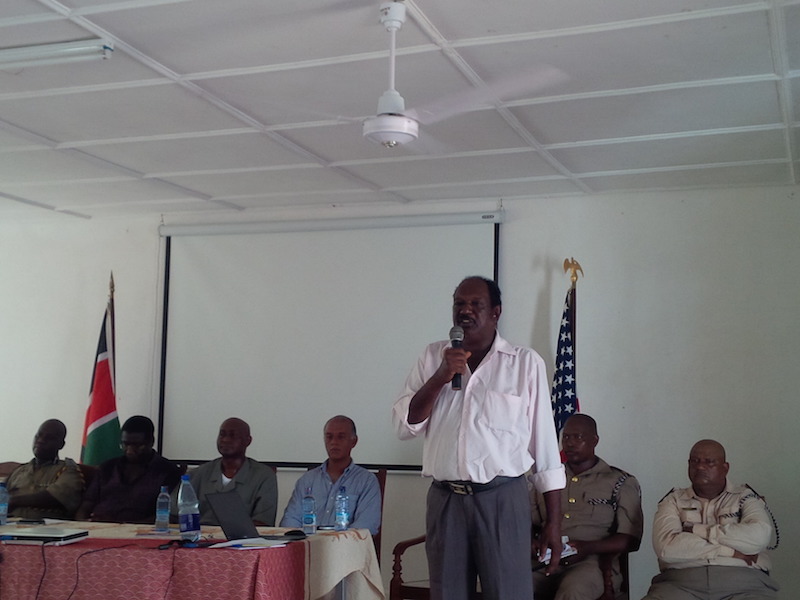 The county commissioner spoke and appealed to chiefs to look at security in their areas, and talk to people, as ultimately, all Lamu people will benefit from the new Lamu projects. He noted chiefs have a lot of influence and can combat propaganda, as people still believe what a chief says and this has a big impact on communities. He asked the chiefs to look out for issues that concern him including ensuring that no one invades other people’s land, especially with violence, that they curb burning of bushes to eliminate historical land barriers, watch out for illegal cutting of forest trees and ensure that there are no more night weddings / night discos – as they had to put an end to the practice of school girls being married off. See Part II which includes a visit to the proposed power plant site. This entry was posted in Amu, Centum, Investing in Kenya, Kenya economic growth, Kenya privatization, Kenya real estate, KPLC, Lamu on April 27, 2015 by bankelele. It’s been over a year and a half since the last urban inflation index. So let’s see what the differences are in tracking changes compared to 5 years ago and to the last index which was in July 2013.. There is a current debate about the impact of many external and internal events on the Kenyan economy and the cost of living. Some of these include insecurity around the country which has directly impacted the tourism sector, investments in infrastructure (the standard gauge railway,) education, electricity generation (coal, geothermal) new laws by counties, unregulated or illegal imports of some commodities like maize and , and digital changes (in public service vehicle fares and television broadcasting) etc. Mobile Communications: Costs are largely unchanged, but there’s a push to do more now. Safaricom launched 4G a few days ago,and like Airtel, they have taken to pushing many messages to reward and retain customers at the same time. Current promotions include buy a Samsung and you may win a BMW, pay by m-pesa and you may win a house etc. Meanwhile Airtel and Safaricom have respectively absorbed the customers and assets of (Essar) Yu that has exited Kenya, while Orange is also looking to sell out. Staple Food: A 2kg pack of (Unga) maize flour, which is used to make Ugali that is eaten by a majority of Kenyans daily, costs Kshs. 101 compared to 104 in July 2013. But it was Kshs 83 in December 2009. Beer/Entertainment: A bottle of Tusker beer is Kshs 200 (~$2.3) at a local pub same as it was in July 2013. However, 5 years ago it was Kshs 140. Other food item: A 2 kg. 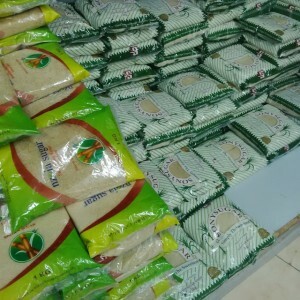 Mumias Sugar pack is Kshs 250, same as last July. However it was 200 in December 2009 and today Mumias Sugar is a shadow of it’s former self limping under debts and losses, with their sugar products now difficult to find in many Nairobi supermarkets. Electricity: Consumers have been told to expect to see an electricity price drop in their bills, but many are not sure. KPLC shifted many customers to a new prepaid system a few years back and it is tough for most customers to understand how far their money goes in terms of actual electricity delivered (see this FAQ)..and while the cost of fuel, forex charges on bills appear lower, it still does not translate into more units of power per shilling. Fuel: At Kshs 106.8 per litre ($5.40/gallon) fuel is slightly cheaper than the 109.52 of July 2013 – and just today, the government has lowered that to Kshs 102.01, with diesel at 90.85 and Kerosene at 71.37. However petrol was Kshs 83 in December 2009 – and with the recently there has been a sharp drop in the international price of oil, there has been expectations that the petrol price drop would be greater. International oil is about $57 per barrel now, compared to $95 in July 2013 and $75 in December 2009. Cost of Financial Inclusion: Bank charges are creeping up for many. The government now taxes a 10% tax on every fee-levied by a bank on a customer – whether it’s for an M-Pesa withdrawal, ledger fee, new debit/credit card, even a tax payment..a tax on almost every charge except for loan interest. Foreign Exchange: 1 US$ equals Kshs 90.56 compared to 87.15 in July 2013. The dollar was exchanging at 75.62 in December 2009. This entry was posted in Kenya economic growth, Kenya taxation, KPLC, Nairobi cost of living on December 14, 2014 by bankelele.